Do your engineering teams use GitHub? 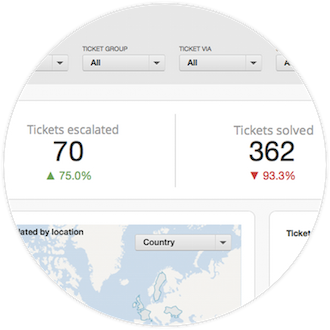 Do your customer facing teams use Zendesk? 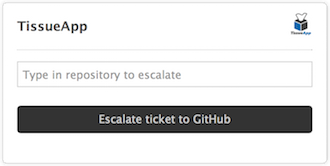 Ever wished you could integrate both those tools and rely on a simple seamless workflow to escalate tickets into GitHub issues in a specific repository and keep the conversation flowing between Engineering and Support? 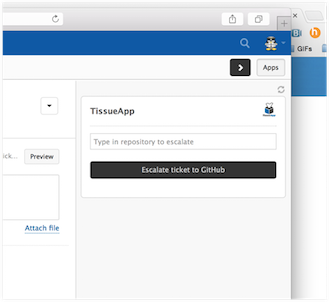 TissueApp will let you escalate in one click and keep the Zendesk tickets and GitHub issues in complete sync. Your engineers will never have to leave the tool that they prefer to use. 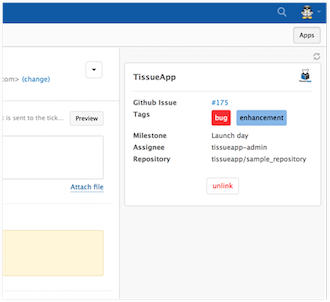 Keep them happy in GitHub and configure TissueApp to bring all the necessary context and information they need when taking on a GitHub issue. 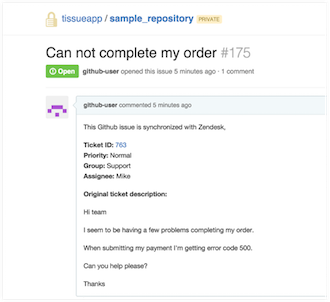 Every comment they make on that issue or on a Pull Request will be synced back to Zendesk. Your agents in Zendesk should be able to know what your engineers are doing when they're doing it. 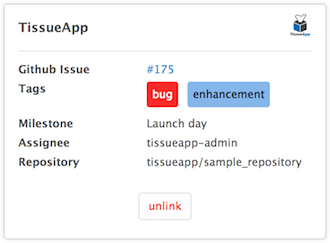 TissueApp will help close that loop by bringing all necessary information about the issue, who it has been assigned to or what sprint it is being worked on directly from the Zendesk Apps ticket sidebar. When they add a private comment it will be synced back to GitHub as well. 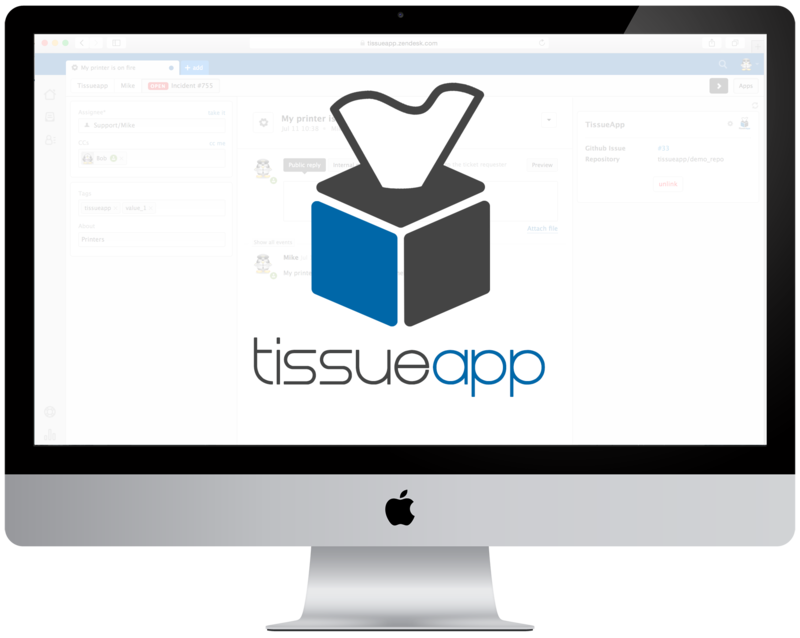 We've built TissueApp following the Zendesk philosophy. 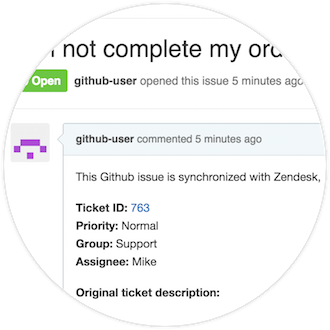 Leveraging Zendesk's tags you are able to report at any point in time on how many tickets you currently have escalated to GitHub. 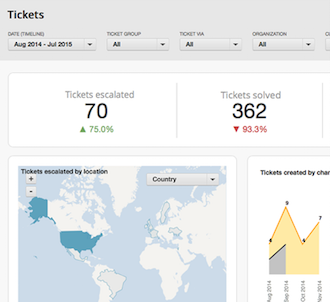 You can also easily build Zendesk Insights reports to see your trends over time.